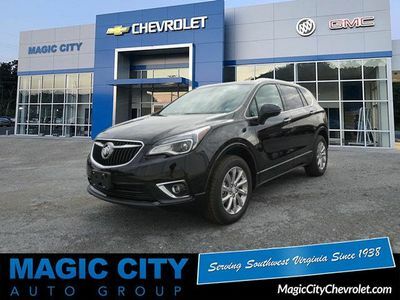 Don't miss out on this 2019 Buick Envision Preferred! It comes with a backup sensor, push button start, remote starter, backup camera, parking assistance, Bluetooth, braking assist, dual climate control, hill start assist, and stability control for an even better ride. This one's a deal at $36,650. Drive away with an impeccable 5-star crash test rating and prepare yourself for any situation. For a good-looking vehicle from the inside out, this car features a stunning ebony twilight metallic exterior along with a light neutral interior. Interested? Call today to take this vehicle for a spin! See more pictures of this vehicle at www.MagicCityAutoGroup.com. Call us today at 1-800-525-1890 to schedule a test drive or just stop in to see us at our locations in Roanoke, VA, Covington, VA or Lexington, VA! We have proudly served all of Southwest Virginia for over 80 years, and look forward to serving you! Contact Information: Magic City Auto Group, 809 Williamson Rd., Roanoke, VA, 24016, Phone: (540) 345-0911, E-mail: internetsales@magiccityautogroup.com.